He was known as “The King of Western Swing,” but Spade Cooley achieved a far darker shade of fame when he was convicted of brutally murdering his estranged wife, Ella Mae, in 1961. It was an abrupt about-face for a man whose public persona was previously defined by his namesake TV show. The Oklahoma-born, Oregon-raised Cooley came from poverty, but he rose to prominence in the 1940s and ‘50s thanks to his musical talents. He earned his royal title (apparently a self-administered nickname) when he became the bandleader of a 30-piece orchestra and held down an unprecedented 18-month stint at the Venice Pier Ballroom. His resemblance to Roy Rogers, both physically and career-trajectory-wise, made his next step a logical one: movies (he appeared in dozens of Westerns) and TV (hosting his own syndicated variety show for a decade). As it happened, rumors that Ella Mae had once had an affair with Rogers contributed to Cooley’s murderous rage (also helped along, no doubt, by his slowing career and drinking problem). The couple, who had three children together, was estranged, and he’d already filed for divorce at the time of the killing. It was a horrifying crime. Cooley’s LA Times obituary noted that Ella Mae, a former singer in his band, was “beaten, stomped and choked to death. At least part of the attack was witnessed by their 14-year-old daughter. 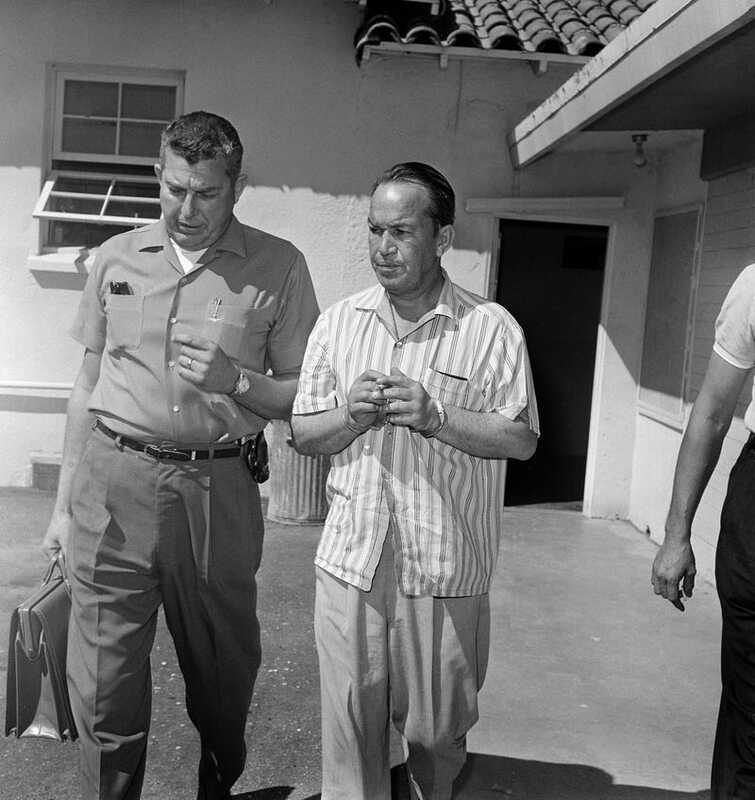 Cooley sat in blood-soaked clothing for hours before calling for help.” In August 1961, after a high-profile trial, he suffered a heart attack upon hearing he’d been sentenced to life in prison. When he died in 1969, country-western bandleader Spade Cooley was on 72-hour parole from the California Medical Facility in Vacaville, where he was serving a life sentence for the beating death of his wife, Ella Mae. He had just received a standing ovation from the audience of 2,800 at the Oakland Auditorium — where he was performing in a benefit for the Alameda County Deputy Sheriff’s Assn. — and stepped backstage to talk with friends when he collapsed. Spade Cooley is believed to be the only convicted killer was a star on Hollywood’s Walk of Fame; his marker was installed in 1960, just a year before Ella Mae’s death. It’s perhaps appropriate that one of his biggest hits was titled “Shame on You.” That’s him on fiddle in the below “soundie” from 1945. Image credits, from top: Spade Cooley outside the sheriff’s substation in Mojave, Calif., April 4, 1961; AP photo by Ellis R. Bosworth. Spade Cooley (at left) performing at a benefit concert Nov. 23, 1969, shortly before he collapsed and died backstage; AP photo.